A fun night out with your family is a great way to enjoy a family vacation in Puerto Vallarta. The night tours in Puerto Vallarta give you the chance to have a great time with your loved ones after an exciting day of sun, sand, water sports, or shopping in the city. A pirate show on Banderas Bay is a fantastic option for entertaining your kids, savoring delicious food, dancing, and just enjoying an unforgettable evening. 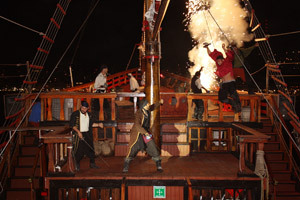 This adventure on the sea starts at sunset on board an impressive pirate ship, where you'll see a swashbuckling battle, with acrobatics and fireworks included. The show starts at the end of dinner. After the battle get ready to continue the party with dancing, drinks and a great DJ! If you prefer something more private and romantic you can enjoy the Rhythms of the Night in Puerto Vallarta. This attraction includes a dance show and a candle-lit dinner in a stunning jungle setting. The show is held on Las Caletas, a beautiful beach that is only accessible by sea. A romantic boat ride under the stars to this magical place is just the beginning of your evening. 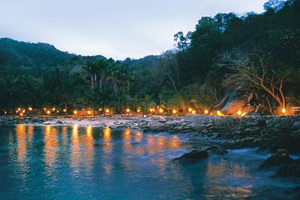 Enjoy the music and dance show while a pyramid is lit up with torches in the wonderful setting of Las Caletas beach. As one of the most famous evening tours in Puerto Vallarta, Rhythms of the Night is ideal for couples, although children can also come along. The fun in Puerto Vallarta doesn't stop when the sun goes down, in fact it is just beginning! Enjoy one of the night tours for families in Puerto Vallarta and have an unforgettable experience during your vacation!